Arguably America's greatest poet, Emily Dickinson (1830-1886) published fewer than a dozen of her eighteen hundred poems during her lifetime. The following is a personality profile of Emily Dickinson based on her work. Emily Dickinson is unconventional and excitable. She is laid-back, she appreciates a relaxed pace in life. She is intermittent as well: she has a hard time sticking with difficult tasks for a long period of time. 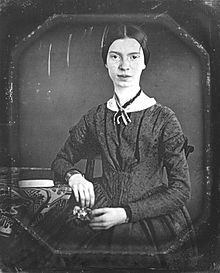 But, Emily Dickinson is also content: she is content with her level of accomplishment and does not feel the need to set ambitious goals. Considers both independence and helping others to guide a large part of what she does. She likes to set her own goals to decide how to best achieve them. And she thinks it is important to take care of the people around him. I used to have a selected compilation of Miss Dickinson´s poems; This one I ordered for my daughter for she was really intrigued by this poetry!